American Classics Reinvented is almost here. Bringing a cookbook is a little like birthing a baby. There’s the initial period when you know you’re writing a new cookbook but you can’t announce it. There’s the part when you grow giddy, telling everyone about an event that won’t happen for what feels like a very long time. Then you settle down into the months of working and waiting, trying to make it all feel real. And then, before it happens, time slows down inexorably. Why can’t that day come now? Our third cookbook (and my fourth book), American Classics Reinvented, is being born tomorrow. We’re giddy and nervous and so ready for this book to be out in the world. We can’t wait for you to have it in your kitchens. This is the sourdough bread from the book. I know I’ve shown you photos of this before, so forgive me for ending August with another shot of bread. However, I’ve been holding the recipe for this bread — after years of working on it, loaf after loaf — close to my chest for more than 9 months now. I can’t wait to share it with you. Believe me, it was hard for both of us to not share the recipe that night. We had to wait. Tomorrow, if you have pre-ordered the book, you can start making the sourdough starter. We hope you will love the food you create out of American Classics Reinvented. Peach pie, fried chicken, macaroni and cheese, a great burger, Portuguese kale soup, clam chowder, hash brown waffles, and coconut coffee custard: this book has a little something for everyone. Might we ask a favor? When you have the book in your kitchen, would you mind spreading the word? As you cook from the book, we would love to see photos and hear stories of what you are making and what you loved. After all, that is why we do all of this: so you can cook food you love. Letting people know the book exists allows more people to find the food they might make for their families. Mentioning the book to your friends on Facebook or putting a photo of the cookbook when it arrives in your home on Instagram? That helps spread the word. And if you use the hashtag #gfgamerica in any of those places, we’ll be able to see your photos and thank you directly. I would love to see photos of gluten-free sourdough bread made in kitchens across America. We’re very excited about the birth of our new book tomorrow. I’m not sure I’ll be able to sleep tonight. Remember, if you pre-order the book today, we’ll send you a thank you gift of 6 late-summer recipes. See this post for details. This offer ends tonight! I just found out mine is about to be shipped; can’t wait to get this cookbook! Oooh, that bread, though! The weather is still sweltering, but can’t wait to get baking. I bought your book, Gluten-Free Girl for the flour mix recipe alone, and I’ve used it ever since. I don’t eat meat or dairy, so I don’t want to buy your next book, but I would like the sour dough recipe. 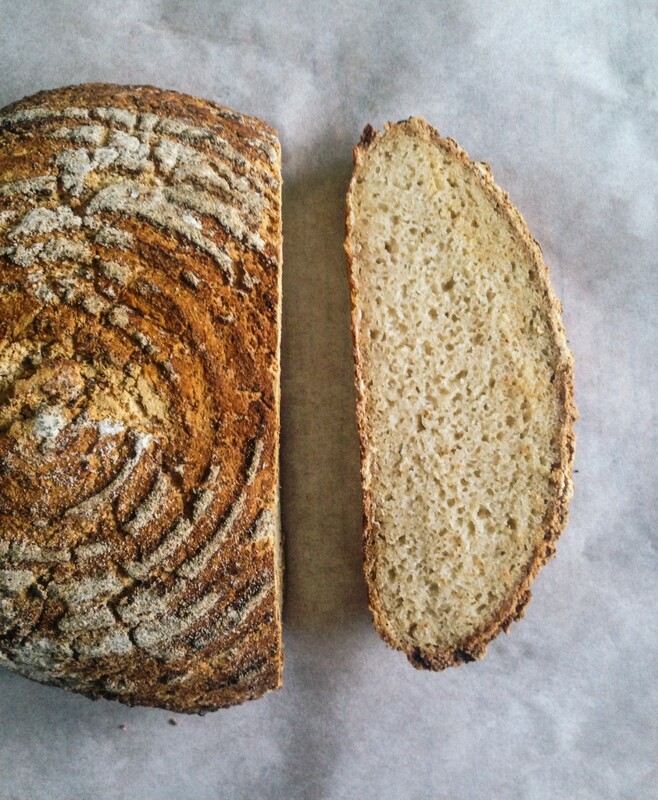 I’ve tired without success to make an edible gluten-free sour dough. Thank you for buying the last book! The sourdough recipe is worth the price of the book alone! We give plenty of non-dairy suggestions. And there is a meat chapter but most of the rest of the book is baked goods. I got my cookbook yesterday. I am psyched. Some of the names of the dishes have made me swoon. Working too much the rest of the week, but I will be cooking from it during this three-day weekend. Thank you, Shauna and Danny. It’s at my front door! I’m opening it now! So excited! Kitchen is clean and ready to go! My copy isn’t arriving until tomorrow, but today I am making your zucchini bread for a neighbor whose wife passed unexpectedly last week. He’s not gluten free but I am sure he won’t even know the difference. Of course I will be doubling the recipe so I get some too! Thank you for that kindness. Give your neighbor a hug from us. I have Celiac disease. My husband bought me several bags of your flour. I want to buy your book. I’m not able to use the computer to buy it. Can I call you (I have no number to reach you) and pay for the book over the phone? Missy, thank you for your interest in the book. We don’t sell it over the phone. It will be in your local bookstore. Probably today! I am SO excited for this book! I have the other Gluten-Free Girl books and I use them everyday. They have been such a lifesaver since the Celiac diagnosis. Truly. They completely changed the way that I approached food, and I am so grateful. Thank you so much for all the wonderful work that you two do! It is so appreciated!! Best of luck with the new book sales! HEY! Congrats! can’t wait to read about your food journey across the US! I peaked in the index and saw a recipe for potato pie filling! I hope it might PA Dutchy inspired. So wonderful to meet you way back then and wishing you much success with the new book! HEY! Congrats! Can’t wait to read about your food journey across the US! I peaked in the index and saw a recipe for potato filling! I hope it might PA Dutchy inspired. So wonderful to meet you way back then and wishing you much success with the new book! Phoebe, that is the Dutchy potato filling, directly inspired by our time with you! Thank you again for that potluck. We think of you often. And we want to come back! Argh! I am stuck at work and I just got the email that American classics reinvented has been delivered to my house!!! Yay to pre-orders!!!!!! But I want to go home and cook now!!!!!!! I received my copy today, right on time! What a lovely, well written book… no surprise there. I can’t wait to make everything!! Oh thank you, Judi. I’m so glad you’re excited to cook. Do you guys ship to UK? Just got the book, the recipes look wonderful. HOWEVER, can I really trust someone who makes a glaring error in the 4th recipe intro? Rosti is practically the national dish of German speaking Switzerland, not Sweden. I am Swiss and have been to Switzerland numerous times and grew up in a Swiss American community. It really is not hash browns, as it is more a cake of finely grated potato, with perhaps some finely grated onion, cooked in wonderful lard or butter. That was a copy editing error and I’m very sorry that it happened. I know that it’s from Switzerland. No matter how many eyes look at a book, mistakes happen. So True!, Just wanted the Swiss to get credit! and I meant to put an LOL at the end. In spite of my last comment, I do think you have wonderful recipes, that I often use and your kids are adorable. My copy of the new book was waiting for me when I got home last night. I looked at every page while making dinner, and was so DELIGHTED to discover the recipe for Michigan pasties!!!! OMG. Last year while visiting my parents in the UP I bought several from Lehtos (best pasties in the UP and part of my childhood) and emptied out the contents to eat – knowing I would have a reaction, and not caring, I wanted to taste them again so badly. And now I can make my own. Thank you soooo much! Shauna, I have been exploring your new book. I can’t wait to perfect your sourdough bread recipe so I can give it to my daughter on her first trip home from college. I have questions. First on morning of day one – when you remove all but 100 grams of starter – are you adding the additional water/flour to the 100 grams or the portion you removed? Then, later on after you use the 120 grams of strengthened starter – what can you do with the rest? Can this just be fed with water/flour (like a gluten starter) and kept for the next batch of bread? Hi Shauna — I have the same question as Carolyn W. about the leftover (strengthened, finished) sourdough starter: can I keep the rest in the the fridge and fed with water/flour like a regular starter? I don’t think it says anyway in the cookbook, unless I missed it. The new book is lovely! Already made the tuna poke, delish! Thanks for everything you’ve done — I’ve learned so much from you! I have the same questions. Love your book. Made the pound cake and it was delicious! Bread is next on the list to try. Chicken and didn’t pre-buy but realized today I had enough Google Play free money to get it. Boom money gone, lol. Cannot wait until I have enough time to start the sourdough. And extra bonus, your last book is only $2.99 now? Also bought. Can I buy this book in the UK? Received the book yesterday! So excited – hard to decide what to try first!! Having a hard time finding raw buckwheat flour. Any suggestions for where to buy it? Do I need to buy the groats and grind it myself?? There are several places to buy it online. We like the Bouchard Family Farms from Maine. But you can easily grind the groats in a blender. They’re so soft! We have a Vitamix but I’ve made the flour in a friend’s older blender with no problems. In the next two weeks! 2) Absolute bagels are the best! 3) Desmond is adorable, just got the book first picture I have seen of him! Congrats! Very excited for you two and the book making its way into the world and getting marked up in kitchens across America. Bought the book and have read the sourdough recipe about ten times and it still scares me, lol. It would be helpful to have a little more info on the sourdough starter process, some pictures of the process, and the gory details a publisher does not want in a book of how you can tell it went bad. We’ll do a social media gathering soon to make the starter together.